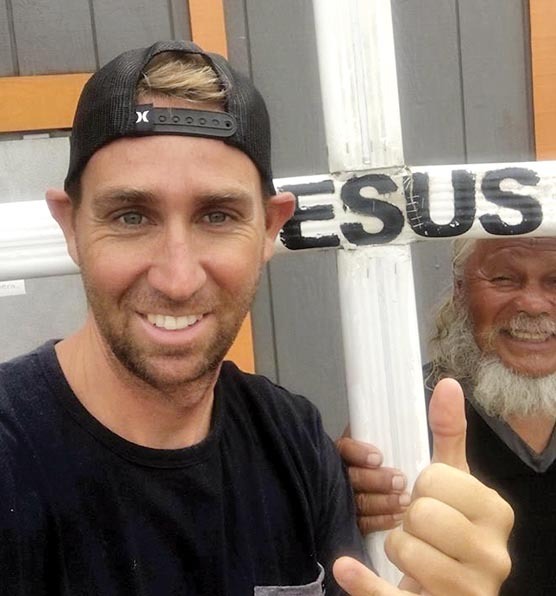 Paia resident and big-wave surfer Curtis Snyder has ridden waves as tall as buildings. This winter, he hopes to reach even greater heights to raise money for wounded veterans and hurricane victims. It’s been nearly two months since Hurricane Florence made landfall in North Carolina, but the heartbreaking images are hard to forget: families wading through waist-deep floodwaters; children carried to safety in the arms of police officers; evacuees arriving at shelters in the pouring rain. And that’s when a plan started to take shape. He decided to raise funds for Port City Proud, a corps of community volunteers that had quickly mobilized to help hurricane victims in North Carolina. Snyder also saw an opportunity to help another worthy cause: Wounded Warrior Project. The national nonprofit organization provides free support services and programs to veterans and active duty service members physically injured in recent military conflicts, as well as those living with the invisible wounds of war, such as depression, traumatic brain injury and post-traumatic stress disorder. Like Port City Proud, Snyder says the Wounded Warrior Project’s mission hits close to home. At the age of 26, he enlisted in the U.S. Coast Guard and served for four years; he was stationed at Maalaea Harbor. When he learned the Wounded Warrior Project was hosting an event on Maui, he signed up to help without a moment’s hesitation — he’d volunteered for the organization as a civilian back in Wilmington, and says it was a transformative experience. “I’ve always wanted to help them out in a bigger way,” he said. When it came time to devise a fundraising strategy, Snyder decided to do it the best way he knows how. Snyder rode his first wave at the age of 6 — and was instantly hooked on the sport. It seemed improbable for a kid growing up in North Carolina, but he was determined to become a big-wave surfer. In 2010, after proving his mettle at surf spots like Tres Palmas in Puerto Rico and California’s Mavericks, he brought his board to Peahi, better known as Jaws, for the first time (and it wouldn’t be the last). Like any big-wave surfer, Snyder yearns for a colossal swell — and now more than ever. Donors can pledge a dollar amount per foot of the tallest wave he rides at Jaws between now and Feb. 4. So, if a donor pledges $1 per foot and Snyder surfs an 80-footer in that timeframe, that donor will be contributing $80 to his fundraising campaign. “We’ll see what Mother Nature has in store for me,” he said. Even if it’s 25 cents a foot, he says every pledge will make a difference — because in the end, it all adds up. Snyder’s fundraiser is hosted by Pledge It, an online performance-based donation platform for professional athletes and their respective causes. Proceeds will be split between Port City Proud and the Wounded Warrior Project; he’s aiming to raise $10,000 for each organization. Snyder encourages others to support disaster relief and recovery efforts — which are still ongoing in the Carolinas, Florida, Texas and Puerto Rico — in any way they can. Noting Hurricane Lane’s near miss in August, he says Hawaii could someday find itself in the crosshairs. “It could happen here,” he cautioned. And if it ever does, Snyder says he hopes residents of other states would step up to help, too. To learn more about Snyder’s fundraiser or to make a pledge, visit www.pledgeit.org/big-wave. For more information about Port City Proud, visit www.portcityproud.org. For more information about the Wounded Warrior Project, visit www.woundedwarriorproject.org. * Sarah Ruppenthal is a Maui-based writer. Do you have an interesting neighbor? Tell us about them at missruppenthal@gmail.com. “Neighbors” and “The State of Aloha,” written by Ben Lowenthal, alternate Fridays.